Undoubtedly, this is one of the most supreme Hen Do packages! 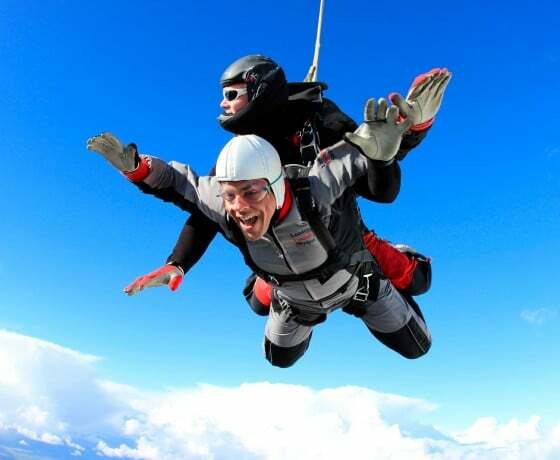 If you want to have a Hen Party which will have all your friends and family talking about for years to come, then look no further than the Hen Tandem Sky Diving activity! You may have tried Pampering, or Paintballing on hen weekends, but hurtling through the skies at 13,000 feet? You will start with a preparation session, to go through all the safety aspects and rigorous training with your professional instructor, prior to your skydive. Once this is complete, you will be provided with your jumpsuit and step onto your aircraft, ready to begin your challenge! Watch the ground disappear below, as the plane gradually ascends to around 13,000 feet. When at the correct altitude, you will be strapped to your highly-experienced instructor and edge towards the door, ready to be given the go ahead! If the adrenaline hasn’t already started to soar, it will as you leap from the aircraft and begin your free fall at speeds of up to 120mph! Feel your heart pounding, as you plunge an astonishing 6000 feet in just 30 seconds! The canopy will be deployed at around 7000 feet, and your descent slows, allowing you a few minutes to take in your magnificent surroundings, as you glide gently through the sky. This fantastic experience might be over in about 10 minutes, but it will be 10 minutes which you will never forget and hen party that you’ll talk about for the rest of your life!! For similar hen activities, check out our Hen Party Parachuting package on our Hen Party Air Activities section.